compiled by Grahame L. Newnham B.Sc. PART 1 - PATHÉ/PATHÉSCOPE FILMING ACCESSORIES - SPLICERS, REWINDERS, PRINTER, STORAGE ETC. Having produced extensive lists of most of the 9.5mm cine camaras and projectors marketed over the years from the early 1920s through to the 1980s or so when home movies had really gone into decline with the onslaught of video; I have suddenly realised that we don't have lists of the various accessories necessary for the making and showing of cine films. Having produced a decent (but still growing!) list of non-Pathé cine accessories, I decided to do this Pathé one separately. Because of the growing size of this list, I have decided to split the Pathé / Pathéscope accessories listing into two pages. Page 1 will contain accessories for filming - splicers, rewinders etc. ; whilst Page 2 will contain accessories specific to cine cameras and projectors. Give me a chance to get this list well under way - then all errors, omissions etc. are gratefully accepted. Sadly none of the items listed below are available to buy new these days, but maybe some will turn up at cine fairs, car boot sales, on that internet auction site e-bay and maybe even on my (this) web-site sales lists! This list concerns the originators of the 9.5mm film format, although some of their accessories were perhaps not the best. 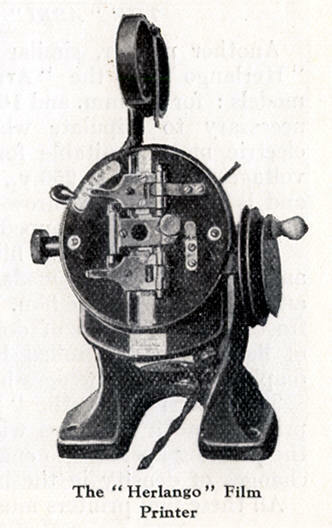 In the 1920s onwards, the equipment was made in France. 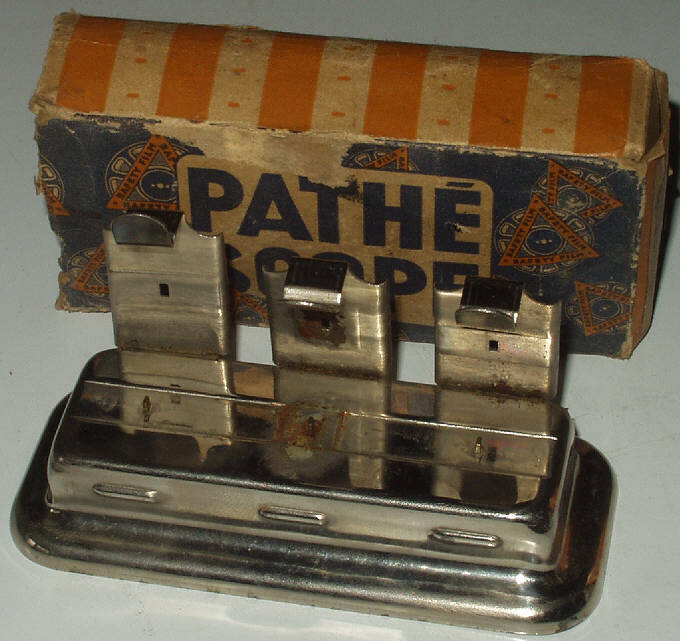 Once Pathéscope had their own UK factory at Cricklewood, North London, UK, some equipment was manufactured or assembled over here. After the second world war more production was in the UK. 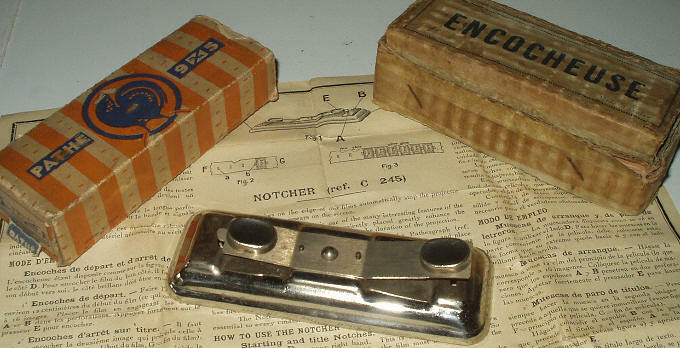 Natutrally all the early 9.5mm Pathé film splicers originated in France. 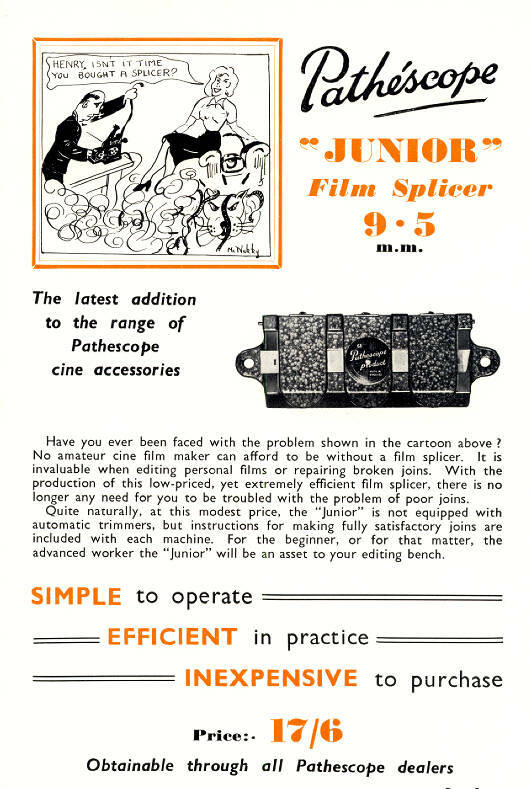 Sadly these were never the best film splicers, but I suppose they did their job and were generally fairly low priced. 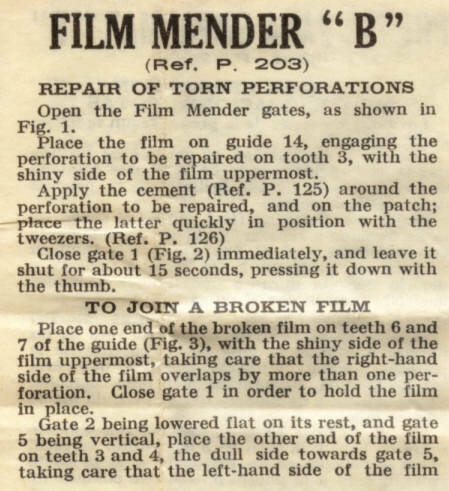 In the UK, Pathéscope normally referred to film splicers (or joiners), as film menders. Generally paperwork referred to repairing damaged perforations or torn film rather than editing. Perhaps the idea of actually editing ones own home movies was a bit radical in the 1920s! 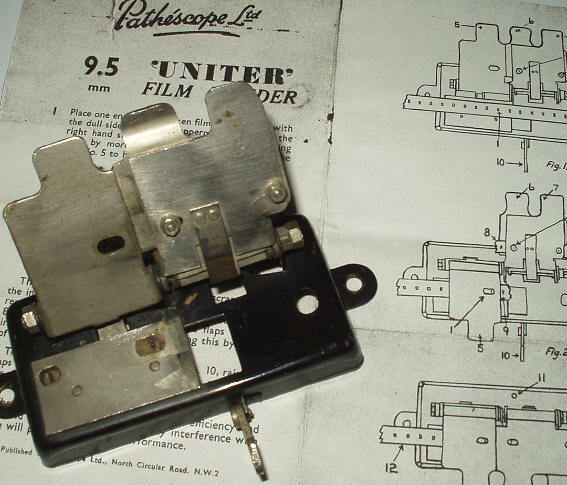 Well, here is what is probably the first 9.5mm Pathé-Baby film joiner (as the UK distributor called it in 1925). 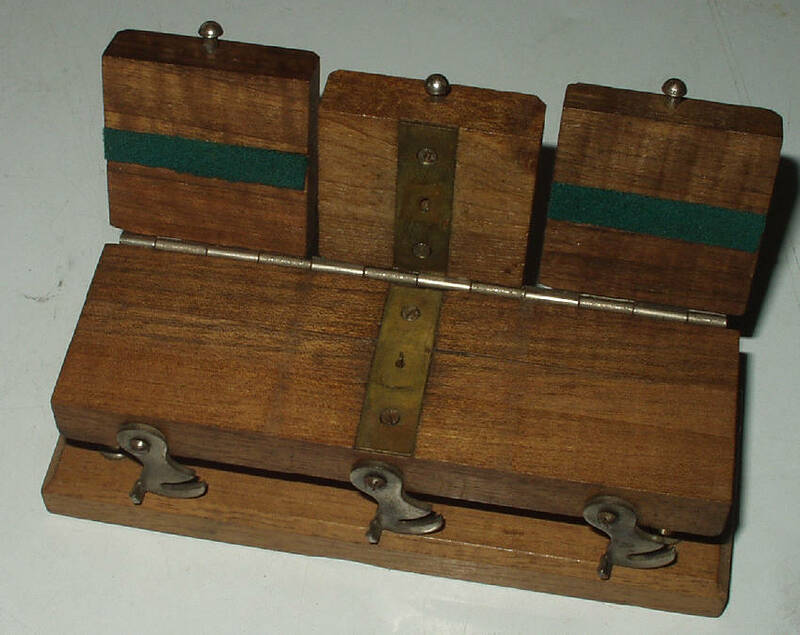 A lovely neat device with a smart wood base and a simple guide channel for the film with locating pins and a centre peg to also allow the use of perforation patches, and a latching pressure plate to keep to two film ends securely in place whilst the film cement dries. 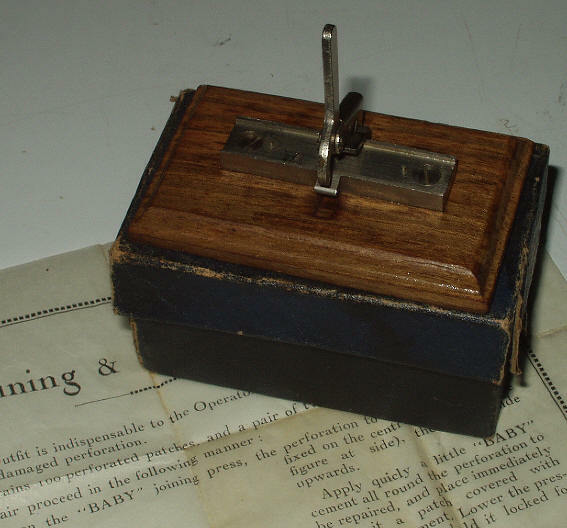 Whilst the wood base is clearly marked 'Made in France' , we know when this was marketed in the UK as the English instruction sheet is marked 01-1925. 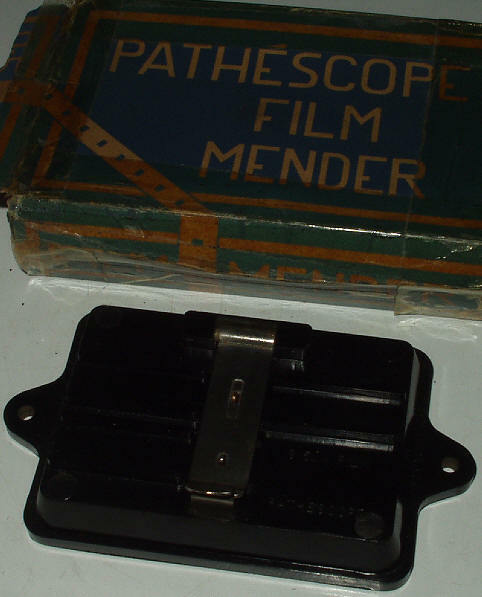 Early wooden 9.5mm Pathé-Baby 'film mender' - nice looking piece of kit! This early 'film mender' or 'presse à coller' in French doesn't seem to have a reference number (or I haven't found it yet!). They do turn up in the UK as well as France, but so far I haven't spotted it mentioned in UK Pathéscope paperwork. 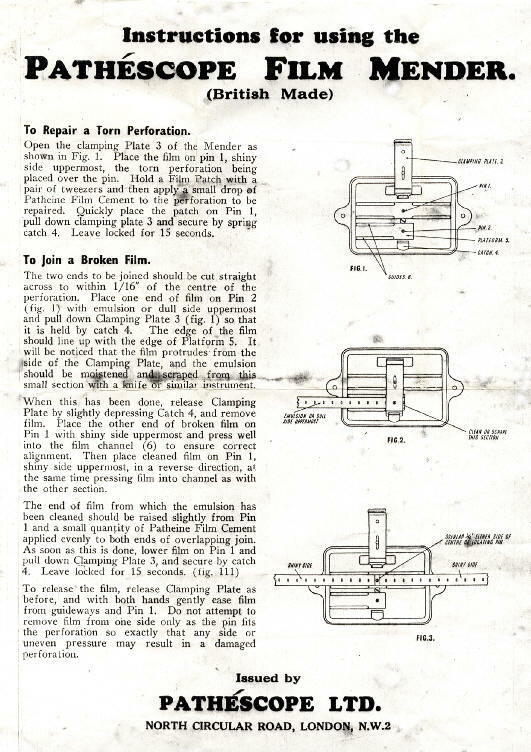 Just a simple jig to hold the film in place after the ends have been cut and the emulsion cleaned off. 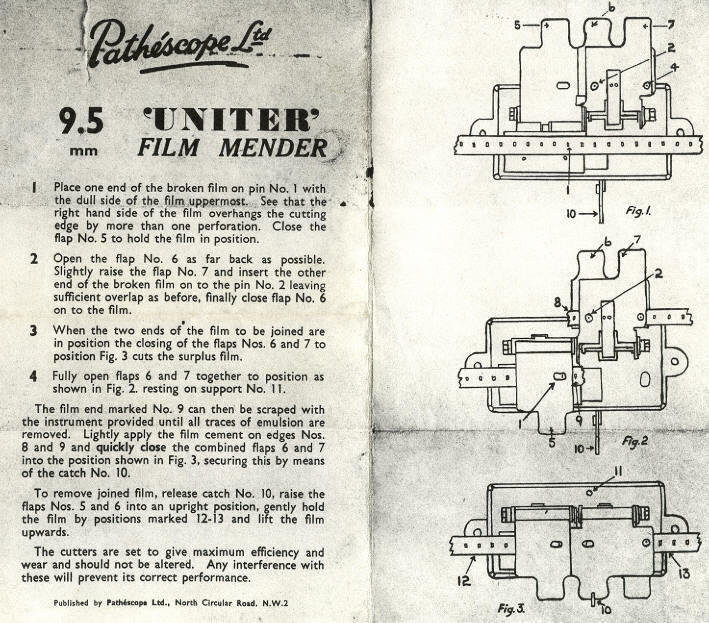 The first 9.5mm film mender mentioned in the UK Pathéscope catalogues from the very late 1920s, seems to be model Ref. P.139 - seen below - described as 'nickel plated steel'. Priced then at 5/- (five shillings - 25p). 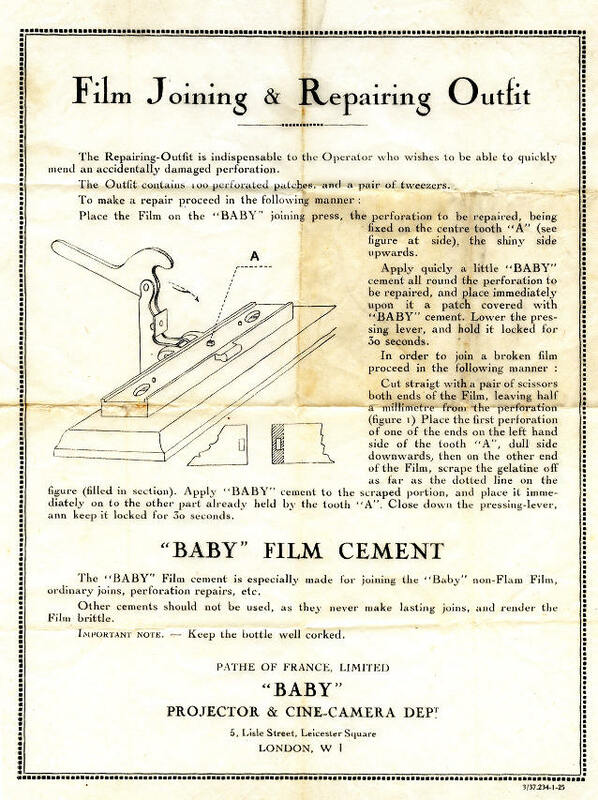 Pathé-Baby must have marketed 9.5mm practically everywhere in the late 1920s and early 1930s! 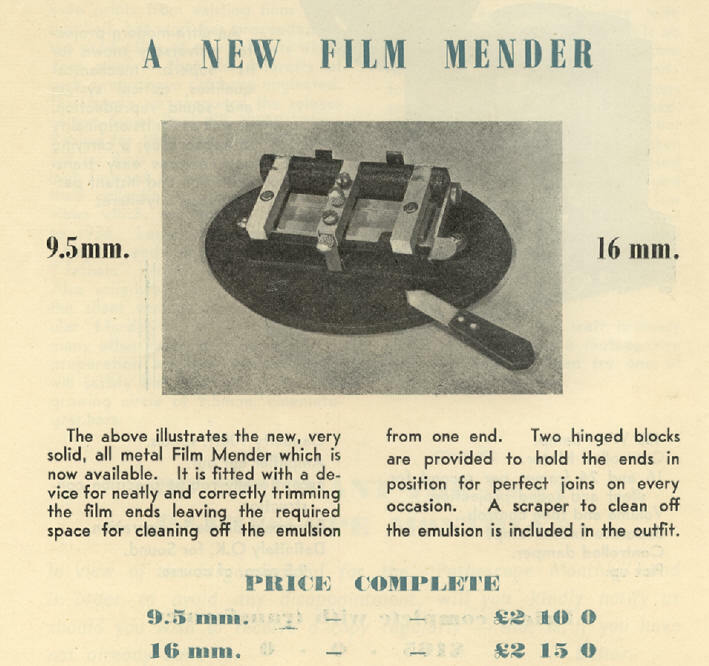 We know that the simple metal film mender (P.139) and the type 'B' quite decent film mender (P.203) continued to be available up to 1939, as they both feature in the UK Pathéscope 1939 catalogue. However as we will see, these models soon became unavailable, only to be replaced by different 9.5mm Pathé film splicers in the late 1940s. Things were under great change, caused by a major event now known as World War 11. 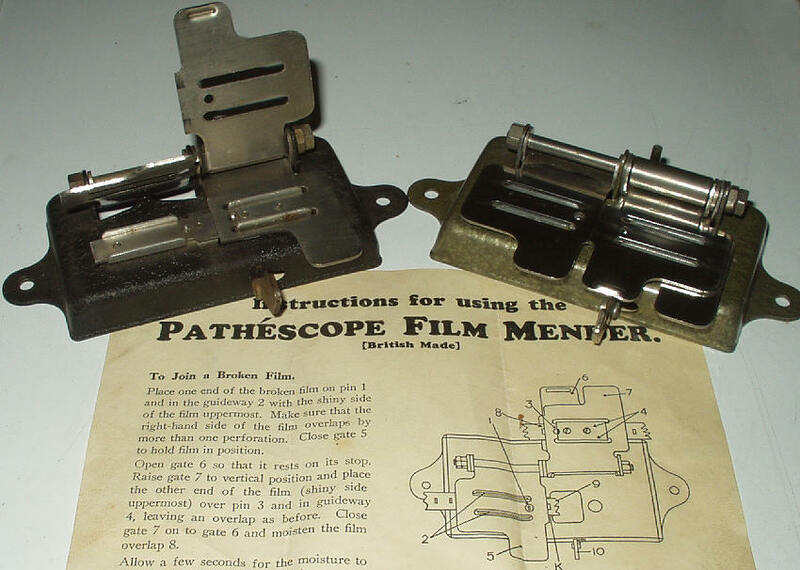 By February 1950 Pathéscope announced a better film splicer ('mender') - this had a film trimmer, a separate scraper tool, and three clips to hold the film. This model was offered in separate versions for 9.5mm and 16mm. 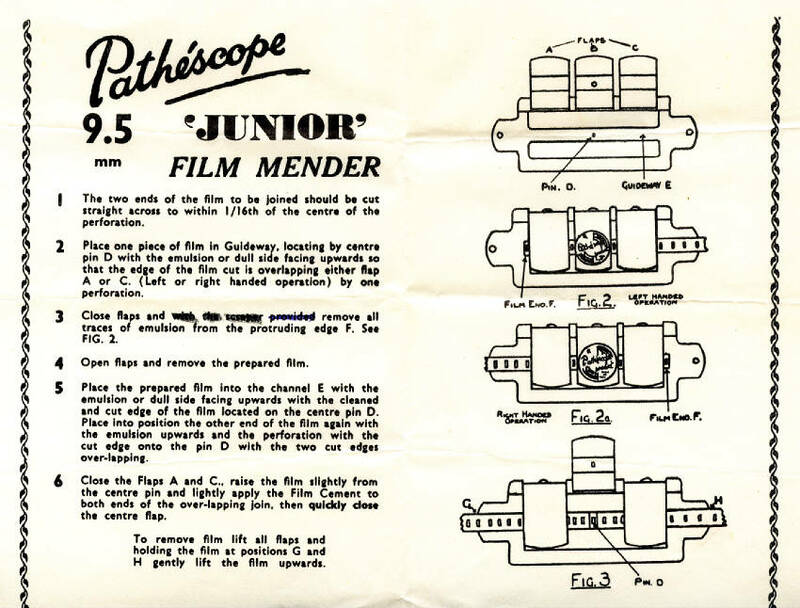 Whilst not mentioned in the magazine, the Pathéscope price list shows the model numbers as P.284 (9.5mm) - priced at £2-10sh (two pounds ten - £2.50) and P.285 (16mm) - priced at £3-15sh (two pounds fifteen - £2.75). An odd point is that the multi-language instruction sheet I have, shows the model numbers as P.286 (9.5mm) and P.287 (16mm). The UK Pathéscope illustration (and my own example) have the splicer mounted on an oval cast metal base, whilst the model in the instruction sheet is just the splicer - no extra base. Maybe the model with the extra base was just for the UK market (maybe even made by or for Pathéscope in the UK?) 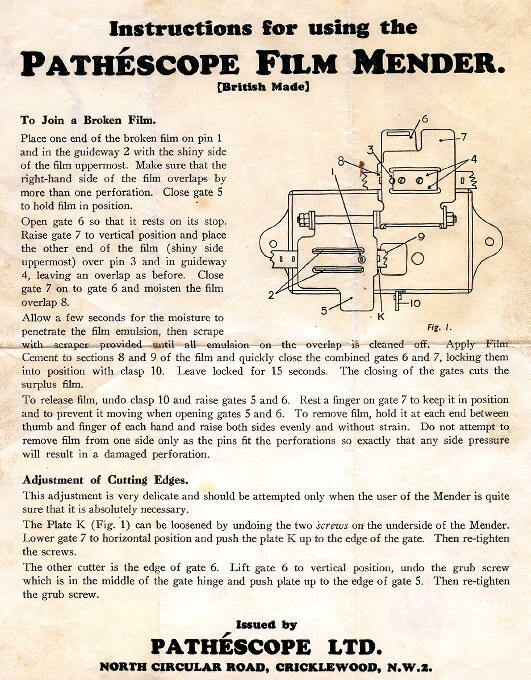 The instruction sheet does mention the special base P.288 and a film rewinder P.289. 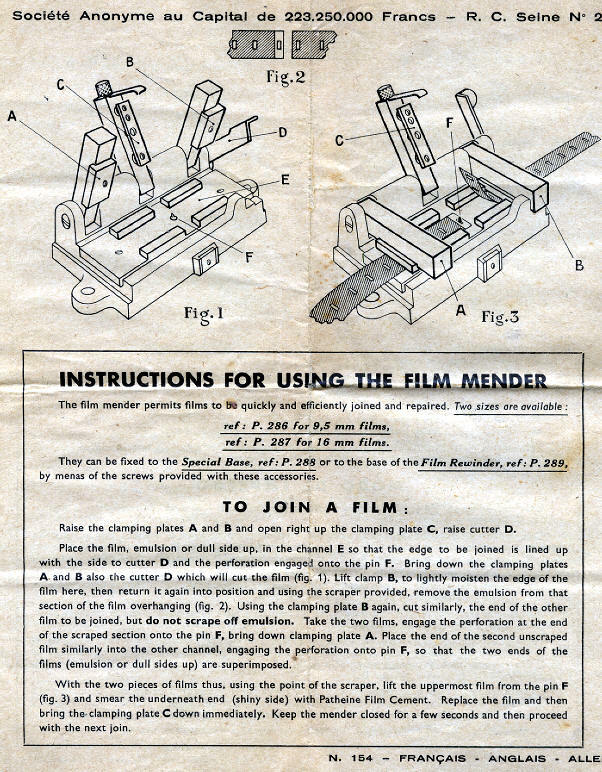 My P.284 film mender, but French box and instruction sheet ....? 'Junior' instruction sheet - note this later batch had no scraper included, hence the words 'with the scraper provided' are crossed out! Now here's a puzzle! 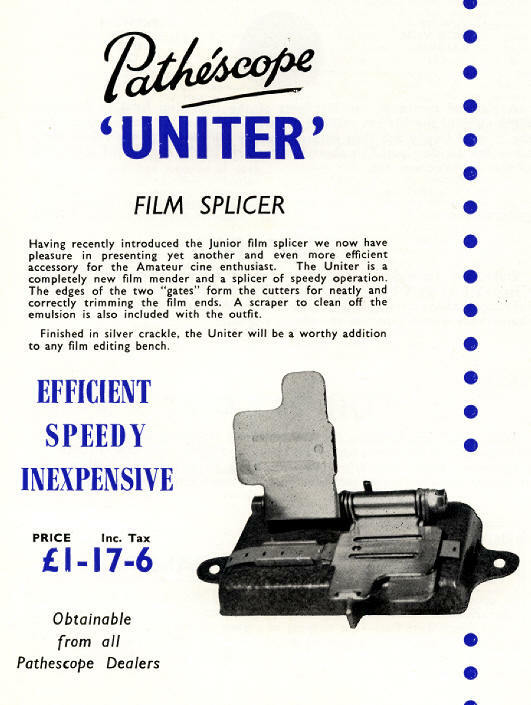 This instruction sheet is headed 'uniter' - and here is the splicer as illustrated; but this is not the splicer shown in the Pathéscope Monthly advert called the 'Uniter' ..... 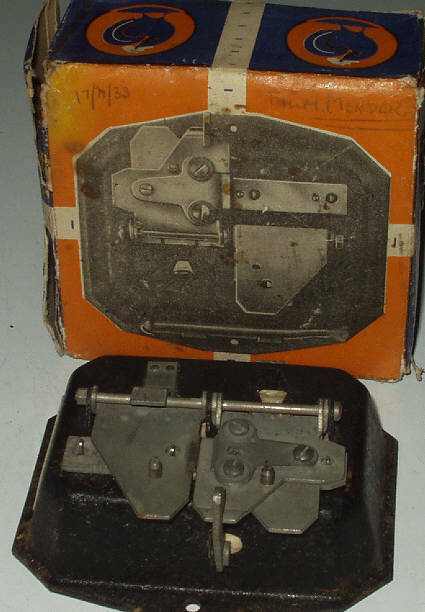 Anyhow, this 9.5mm splicer again has clips for the film pieces and these also cut the film ends - just a simpler design than the splicer just above. 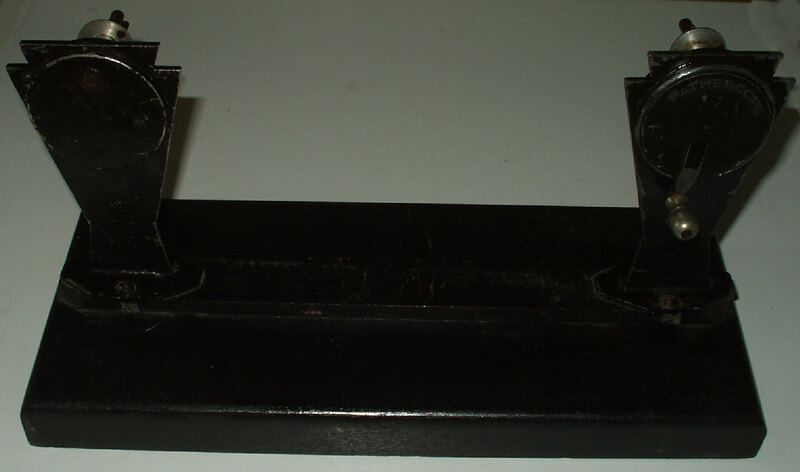 Again a pressed steel base, this example in black crackle finish. Currently can't find a date, an illustration or price - the search continues! Just spotted this one in the 1939 UK Pathéscope catalogue - but still listed as the model 'B'. Supplies of the earlier one must have run out!! Finally, the last Pathé film splicer in my current collection. 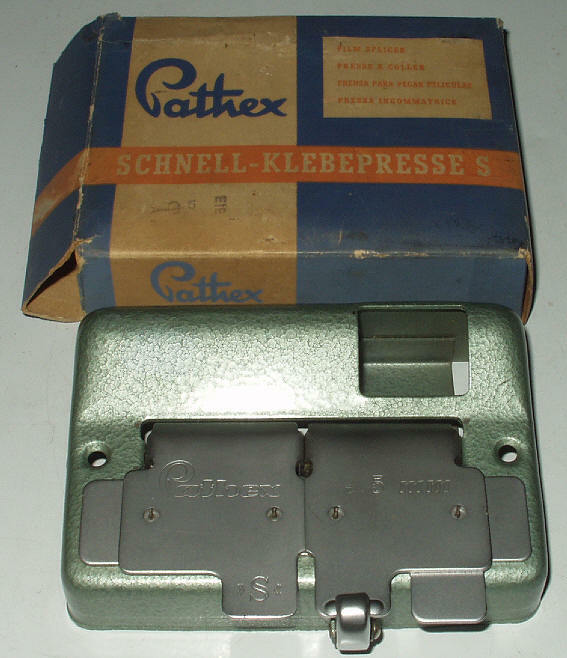 This example is made in Germany and is branded as Pathex, the post-war German Pathé distributor. Although it's in the original box there are no instructions. Has a built-in scraper and the cut-out hole is for the Pathé film cement bottle I guess. Must try and make a splice with this one - quite rare I guess. The box does have 'film splicer' in English as well as German, French and Spanish, but I don't recall these being marketed in the UK. The 'S' on the top suggests this was model 'S' perhaps. Must date from the 1950s I guess. 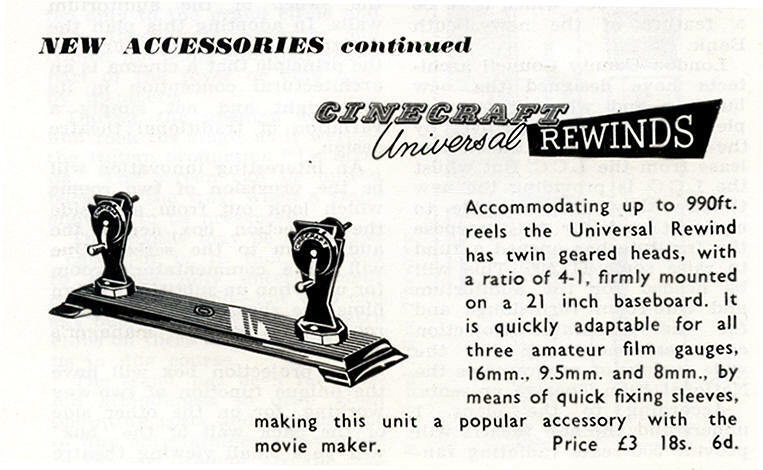 There was a similar model for 8mm / 16mm film. 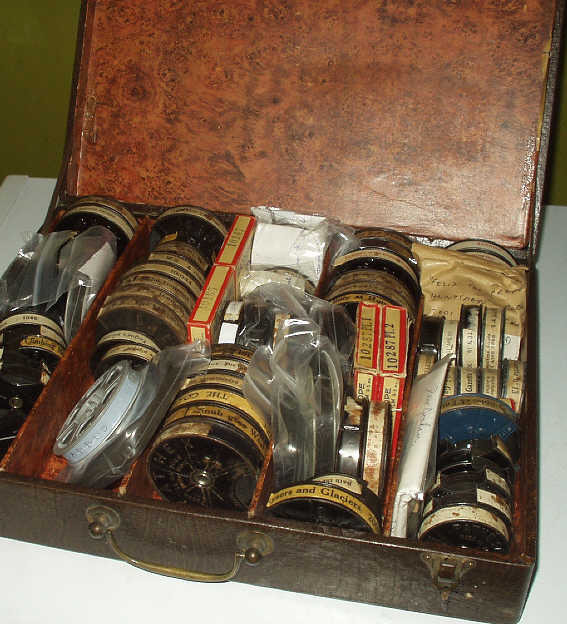 Another accessory from the late 1920s - listed in 1929 or 1930 as 'mending patches' - this little kit contained a small tin of 100 tiny circles of clear acetate film with standard 9.5mm sprocket holes. 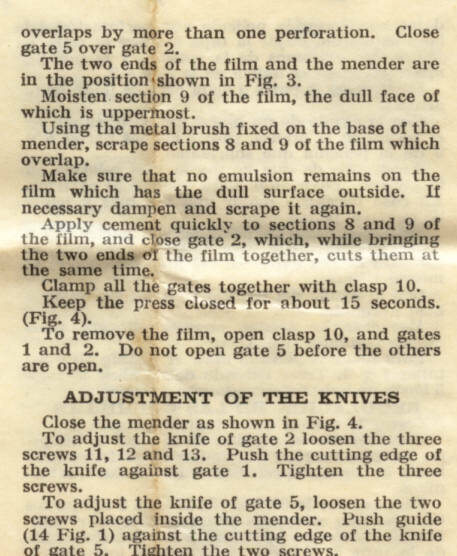 These could be applied to damaged film using the tweezers supplied and a suitable film mender which had the necessary guide pegs, like the model P.139 above. The pack illustrated, ref.no. P.126 cost all of 6d. (sixpence 2.5p). To join the film or attach those mending patches one needed the special solvent. 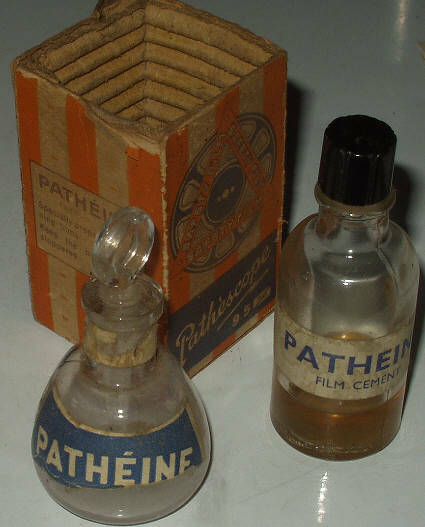 The film cement supplied by Pathé-Baby and Pathéscope was always sold as 'Patheine'. The early glass bottle came with a lovely glass stopper and dropper. Sadly most of my Patheine has long since evaporated - doubt that bit left would be much good today! The original reference number was P.125 and it cost 1/- (one shilling - 6p) a bottle. The early 9.5mm printed films from Pathé-Baby all had just a few frames for each title and a notch on the edge of the film stopped the projector for a few seconds whilst viewers read the words. The ends of each film had a long slot cut where the perforations should be, stopping the film before it was pulled out of the little metal cassette. 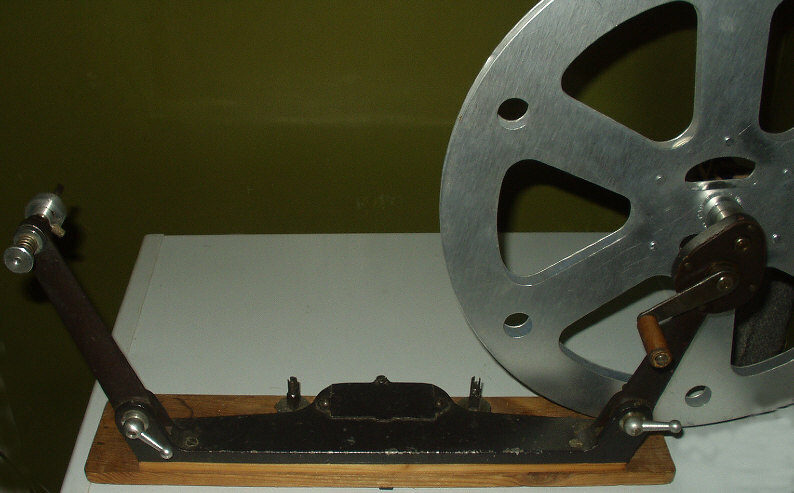 This film notcher device enabled users to make these cuts in their own films. Once brighter projector lamps were used in the early 1930s, this little idea of film economy was soon dropped. As can be seen from the above advert, the ref. no. was C.245 with a 1930 price of 5/- (five shillings - 25p). 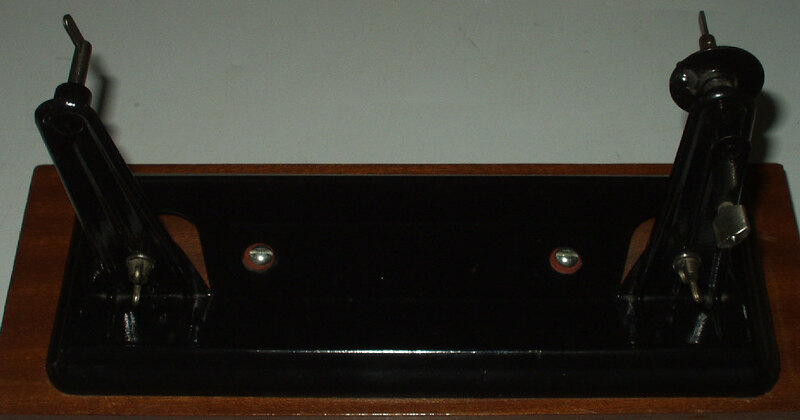 Another 9.5mm Pathé film notcher - pressed steel base - maybe earlier model? 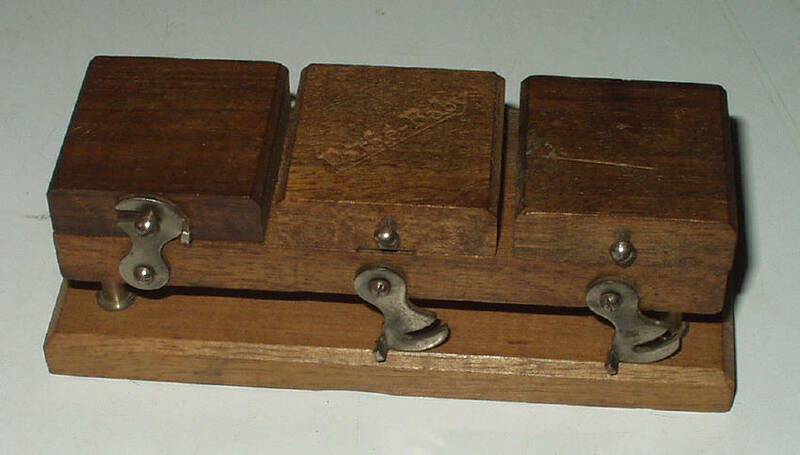 This neat pressed steel set of 9.5mm rewinders has been home mounted on a small wood base - I can just make out 'France' on the pressing, it's a 'Baby' rewind handle too - a lot of Pathé stuff wasn't actually marked - so probably early French Pathé-Baby - can anyone confirm? 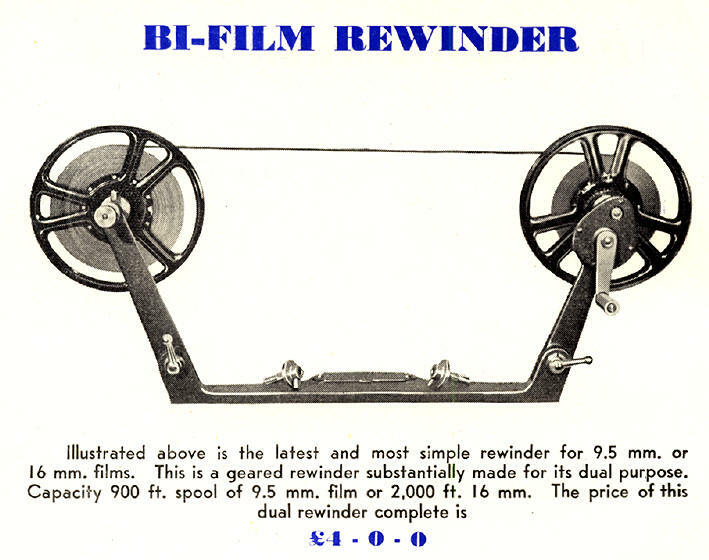 I'm assuming these are the "Super reel rewinders" from around 1928 - reference number P.138 - price around 1930 was 12/6d (twelve and sixpence - 62.5p). 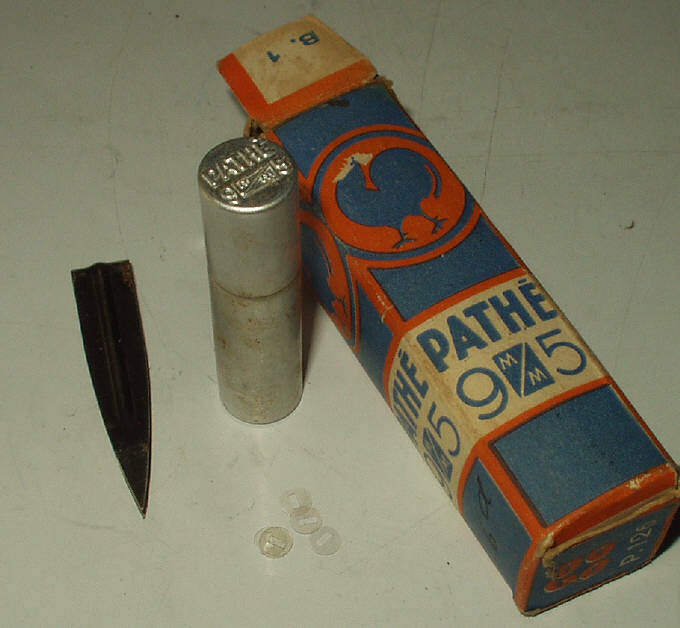 9.5mm film rewinders, marketed by Pathéscope Ltd in the 1930s, but actually UK manufactured by Cinecraft. They normally took up to 300 foot / 100 metre spools with the right hand spool arm handle driven, geared up about 3:1. The 9.5mm adaptors were removable, so maybe 16mm adaptors were also available. By mounting the two spool arms on a 1/2 inch wood batten, my own example below, will take up to 900 foot / 30 metre spools. 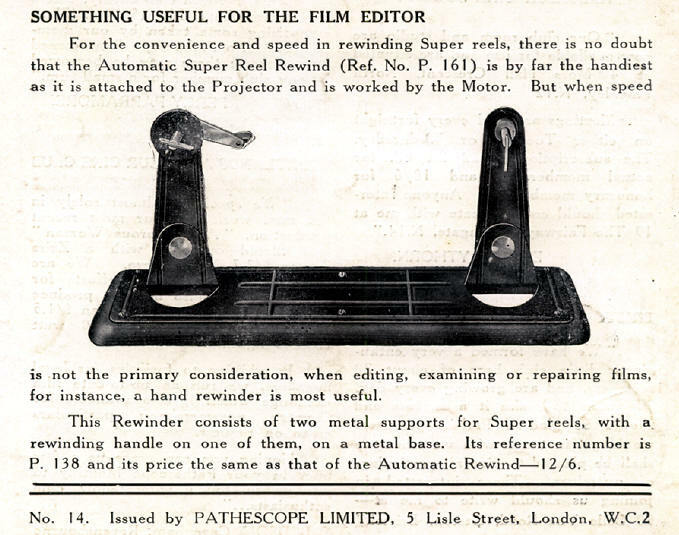 Announced in the Pathéscope Monthly magazine dated April/May 1950 was this quite useful dual-gauge 9.5mm / 16mm film rewinder. One arm was plain, the other with handle drive geared up about 3:1. The basic rewind bench would accept spools up to about 2000 foot (ideal for 16mm), but I have mounted mine on a larger wooden base with an extra 1/2 inch piece of batten - this then also accepts my Presto 'giant spools' which can take up to 2400 foot of 9.5mm film. (Sadly these spools are no longer available) The spool arms fold down flat for easy storage. Gauge change is by slip-on adaptors. I have had a good look at my example, but can see no country of origin. I assumed these are UK made, cast metal finished in the Pathéscope bronze colour of the early 1950s. 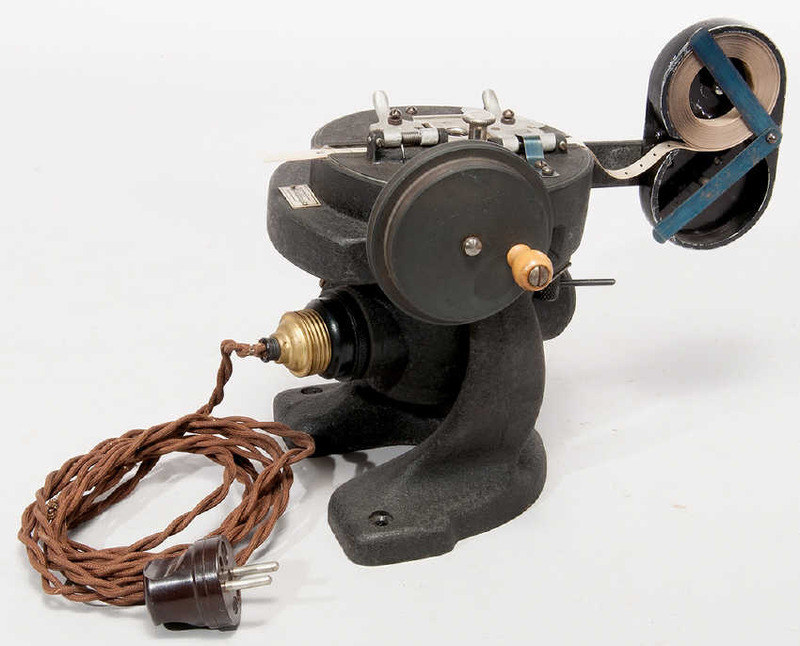 Maybe the film mender P.284 listed above (which is the same colour and fits this rewinder is also UK made - or of course, - maybe they are both French made ...... Can anyone help please! 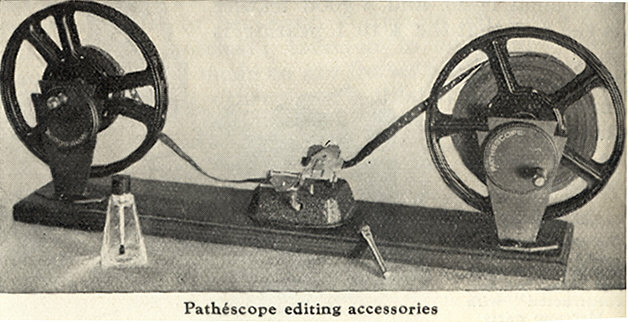 By 1956 Pathéscope announced new type rewinders (from Cinecraft again), these would now accept up to 990 foot spools (very useful now that many of their projectors accepted the larger film spools). These would also accomodate all three film sizes. From the illustration, the units look much the same as the pre-war version, but are mounted on the baseboard so that the spools overhang the edge allowing for the larger size! 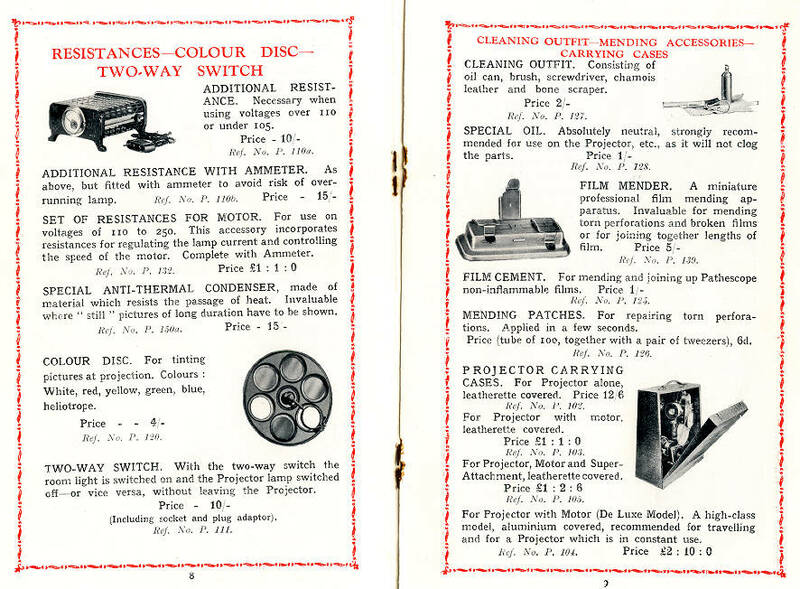 Owning a device to actually print film copies is rather a luxury, but from the early 1930s, Pathéscope included this really nice looking 9.5mm film contact printer in their sales catalogue. With the name of Herlango, I assume this wasn't an actual Pathé product, but was distributed by them. It doesn't seem to have had a Pathé reference number. The Herlango film printer is fully described and illustrated in the sought after Harold B. Abbott book "The Complete 9.5mm Cinematographer". 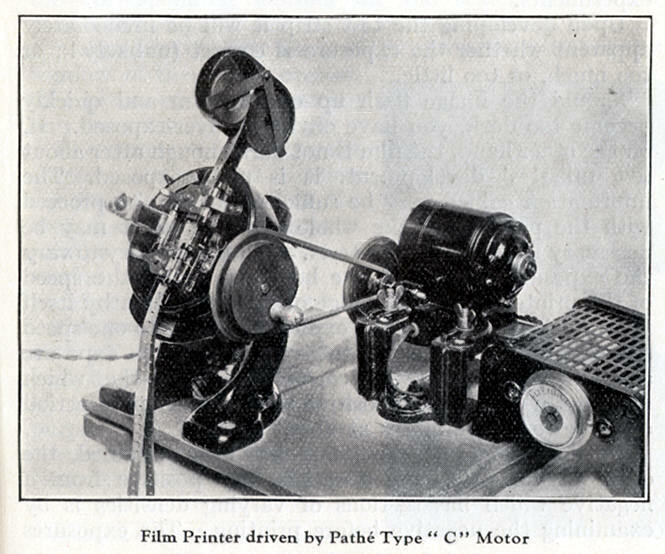 It was designed to be driven by the Pathe "Baby" projector type "C" motor attachment. Obviously used in the dark (or red light for positive print stock), the original film and print stock were accomodated in rolls in what looks much like a "P" film charger and probably just dropping onto the floor or into a convenient black bag. Herlango 9.5mm contact printer - slightl;y different design with film running horizontally or does the mechanism swivel? I have never actually seen one of these lovely machines in the flesh - maybe one will turn up someday! I have now discovered at least three types of Pathé 9.5mm film storage boxes/cases. 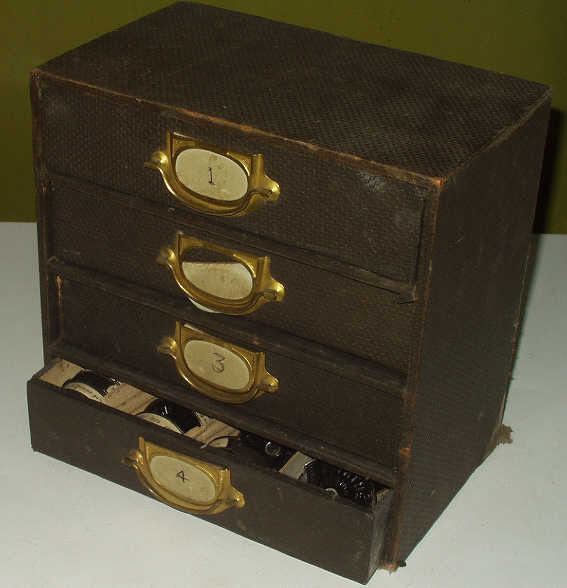 All three are listed in the Pathéscope 1931 sales catalogue. 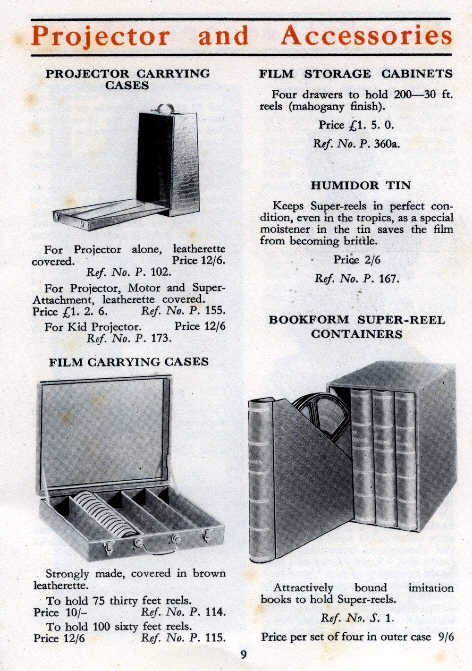 I have still to find one of the 'Bookform Super-reel Containers. These were intended to house the 300ft / 100m spools, so as to sit on a bookshelf. 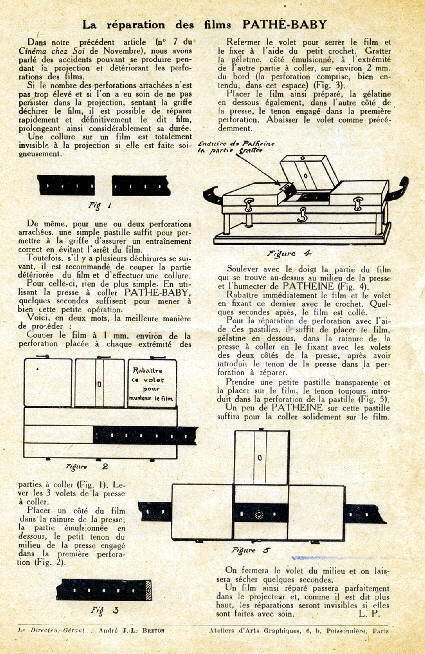 The one above is also illustrated in the 1933 Pathéscope catalogue and described as a 'film carrying case'. 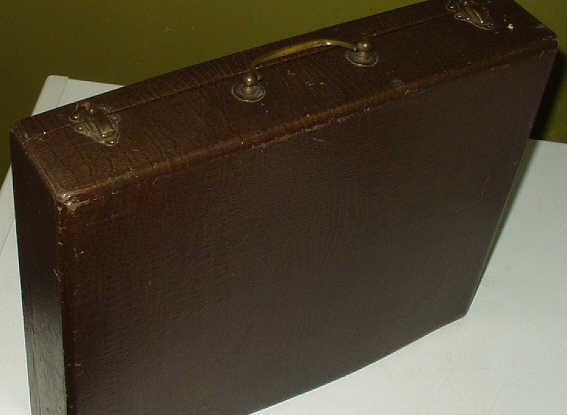 This is a flat briefcase style affair, covered in brown leatherette. One size could take up to 75 x 30ft/10m cassettes - ref. P.114; another up to 100 x 60ft/20m cassettes. - ref. P.115. Mine seems to be the larger model. The other item I have, which I think turned up in a French 'car boot' fair is a rather nice cabinet style box that has four sliding shelves, each taking up to 40 x 30ft/10m cassettes, a total of 160 cassettes per cabinet. 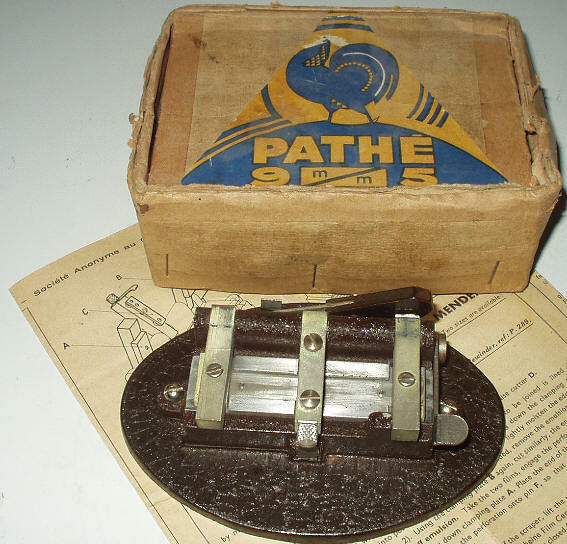 (The catalogue mentions up to 200 cassettes, but Pathé-Baby were often prone to a little exageration!). I guess this was made in France, it has the same brown leatherette finish aas the carry cases described above. I was really lucky that the one I have was almost full of early Pathé-Baby 30ft/10m notched cassettes - and most virtually unused! Titles in French of course!